Is Jose Still the ‘Special One’? Josh Sagoo in Current Affairs Sport on 29 December, 2017. The man who stunned the footballing world with his messianic foretelling that he was ‘The Special One’ intended to leave his mark from the very beginning as one of the true managerial greats of top flight English football. Mourinho’s ‘Special One’ status has come under fire since taking over at Old Trafford. And that he did, successfully catapulting his Chelsea teams to multiple Premier League titles and numerous other decorated silverware. Despite his final season at the club being well below par by his standards, the impression he had left on English football through his unstoppable teams and the tactical masterclasses he had produced on the pitch had already cemented his status as a true footballing icon…some would say the best manager in world football. With the departure of Louis van Gaal after a disappointing two-year spell at the club, Jose’s arrival at Manchester United was the breath of fresh air that the club’s fans had been hoping for. He was the best man for the job, or at least it seemed so at the time. His acumen on the side of the pitch and his desire to win at all costs revived this messianic conviction among United fans that Jose was ‘The One’. With Jose at the helm, trophies would be guaranteed (if we forgive his final season at Chelsea), and he did deliver. Winning the League Cup, the Community Shield and, most importantly, guiding United to the Europa League which thus granted them a much-needed return to Champions League football. The one true successor to Fergie’s glittering dynasty? Achieving the second goal, along with the addition of two other less-esteemed trophies was therefore enough to see Jose continue his contract with United into the 2017/18 season. The reasons explaining United’s mediocre performance this season should be viewed as twofold: 1) the dominance of Pep Guardiola’s Manchester City in terms of results, and 2) the Spaniard’s superior style of play to match. The only factor for which Jose cannot be explicitly blamed for is the glaringly obvious notion that Pep’s fine-tuning of his City players over the summer, along with his nonchalance in splashing the cash that has transformed his team into not only the best in English football, but potentially the best in all five top-flight European leagues. Pep Guardiola’s Manchester City have been too good for Mourinho’s United this season. With the swathing amount of money which has been circulated during City’s Summer transfer campaign, a title win for Guardiola had to be imperative. With Pep’s team cruising past all of last season’s top-flight teams with well-earned victories and with such a large margin separating City from United (who currently rank in second in the league) the burning prospect of United overtaking City was almost certainly extinguished after their recent 2-1 loss to them which extended the gap to 11 points. In a recent interview, Mourinho sought to justify Manchester United’s position of second in the league by explaining that if this had been any other season United would have been the frontrunners. Though there is certainly strength in his claim it nonetheless exacerbates the futility of United’s title hopes. Since returning to the Premier League, it has been inconceivable amongst football critics to not place him against his former La Liga adversary, Pep Guardiola. Now mid-way through the season Mourinho’s failure to reach the top spot has been largely due to his highly mechanical tactics which have stood in the shadow of the attractive attacking football Pep has incorporated into his team. Mourinho, notorious for grinding out favourable score lines at the expense of playing ‘boring’ football has thus been the scapegoat for United’s inability to level with City’s stellar form. On the other hand, Pep’s flair football has astounded the pessimists who believed that such football could not be played in the Premier League, and has if anything fuelled further criticism of Mourinho’s chosen style of play. 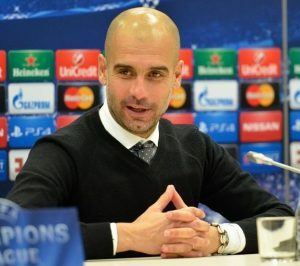 Given that Pep seems to be reaping the benefits from his philosophy, criticism of Mourinho seems only fair, and perhaps more justified when he has failed to maximise the performances of his star players and marquee signings, unlike his City counterpart, who has completely revolutionised the footballing minds of Raheem Sterling and Kevin De Bruyne. Unless Mourinho manages to win United the Premier League title, many (both critics and fans alike) would regard his spell at United as a failure. Some might argue that the expectations that accompany the United managerial role are simply too demanding and dismiss the thought that a title triumph would be more likely to unfold out of a long-term project rather than from spontaneity. It is important to not downplay Mourinho’s current achievements at United with a success rate ratio just below that of Sir Alex Ferguson’s and above those of David Moyes and van Gaal, whilst also achieving some silverware. Yet, the proposition that Jose is ‘The One’ to guide United to a title win is if anything even further in doubt than it was at the end of last season. Jose was correct in assuming United would be first in any other season, but this current one has seen an unstoppable Manchester City sweeping past national and European teams with ease. With Guardiola constantly strengthening his case to be the best manager in world football and with United being so far off the new standards created by City, it is only rational to postulate whether Mourinho will ever win Manchester United that long-awaited Premier League title.